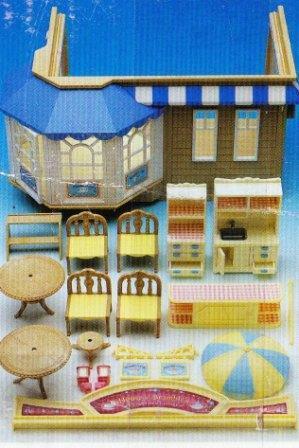 Sylvanian Families Brambles Department Store can extend up to three stories with the addition of Bramble Cottage on the top floor. It was also marketed as Applewood Dept Store, with Applewood Cottage making the optional additional third floor. Exclusively in the UK a version was sold as "John Lewis", through John Lewis stores. 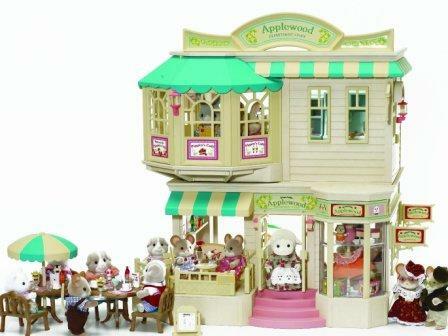 Additionally a version of the Applewood Store was sold in Harrods with a sticker pack to brand it as "Harrods". Many of the accessories are colour coordinated for the particular store, Brambles being blue, Applewood light green and John Lewis dark green. Unless specific to a store such as signs, accessories are simply listed by colour. 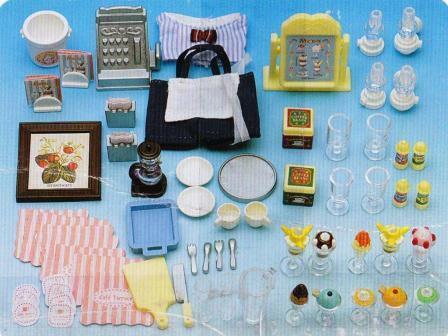 There is an extensive set of accessories with this Sylvanian Families model, too many to list, but there is a good chance we may have most, please email with enquiries. Many of the parts are interchangeable between the aforementioned models, though note that railings and doors on Brambles and John Lewis are white, though they do readily fade to a yellow, the Applewood Dept Store models had yellow fittings to begin with. The parasols also have different colours according to store. If you need parts not listed please message/email/phone. Main shop sign This is the main sign on the roof of the Sylvanian Brambles Store.